Receive occasional e-mail updates regarding Aristos publication and other news. Read exclusive Aristos-related content on art, music, and ideas. Shopping at 1,700+ brand-name stores benefits Aristos. Please make a donation, however modest, via PayPal (using credit card or PayPal account). Aristos is published by The Aristos Foundation, a 501(c)(3) nonprofit organization. * "Reading Aristos has given me much pleasure and instruction." Spring: Kitchen Gardens, 1893, Alexei Kondratyevich Savrasov (Russian, 1830-1897). Oil on canvas (dimensions unknown), Perm State Art Gallery, Perm, Russia. View superb images of 252 paintings by Savrasov on The Athenaeum website. 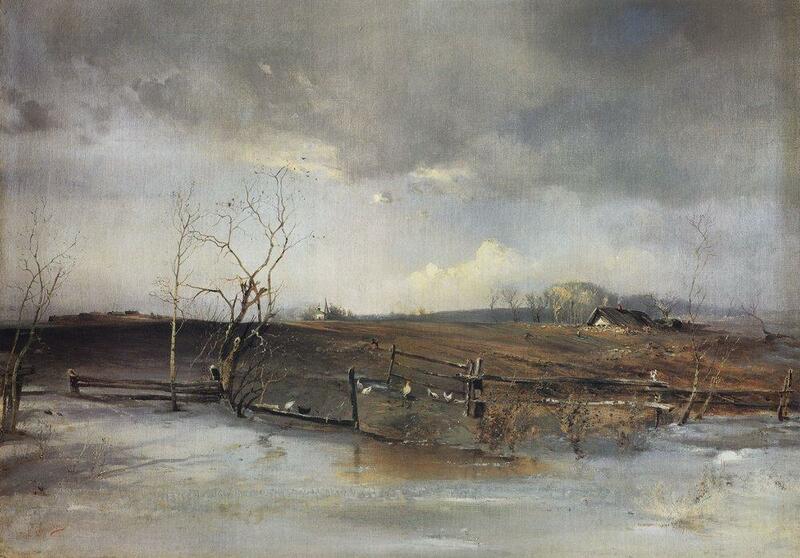 According to the online magazine theartwolf.com, "Savrasov was one of the most important--arguably the most important--of all the 19th-century Russian landscape painters, considered the creator of the 'lyrical landscape style.'" From what we have seen online, he may be among the greatest of all landscape painters of that century. 3/18: Bouguereau & America, Milwaukee Art Museum, Milwaukee, Wisconsin. [Scroll down for titles of the first four works displayed. Click on "Open Interactive Map" for images of all the works in the exhibition, and on each image for its title and provenance.] Closes May 12. See Further Reading and Viewing below. Further Reading and Viewing - L.T. * "Bouguereau's Legacy," Richard Lack, Aristos, September 1982. * "William A. Bouguereau: The Academic Tradition Personified," Rehs Galleries, New York. * Exhibition review, ArtDaily.org, March 7, 2019. Among Bouguereau's Most Notable Paintings - L.T. Aristos and related projects are supported by the Aristos Foundation, a 501(c)(3) nonprofit organization. We depend on tax-deductible contributions from individuals like you to continue championing traditional contemporary arts and combating the avant-garde. Please make a donation, however modest, via PayPal (use your credit card or PayPal account). About, sample articles, reviews, back issues. . .
What Art Is: The Esthetic Theory of Ayn Rand, by L.T. & M.M.K. (Open Court, 2000). Chapter Summaries, Reviews/Responses. . .
on the Future of the Fine Arts (Open Court, 2016). Become an Aristos Sponsor! Connect with our discerning worldwide readership. Paintings and essays by a pioneering Classical Realist artist, plus books, prints, and much to delight the eye and mind. Music study materials for string teachers and students by cellist and master teacher Faith Farr. Worksheets and integrated theory, performing, and rhythm assignments. An inspiring organization founded in 1983, dedicated to enabling people with disabilities to participate in long-distance-running events.